The centralized management software, C21 Live Control, facilitates the integrated operability of a video streaming platform, encompassing the entire value chain, linked to the possibilities of all its components in all their deployment options: appliance, software, public and private cloud services. It immediately meets all the growth needs, whether present or future, sizing, flexibility, high availability and quality. In its 2015 annual evaluation of strategic suppliers, the EITB Group appreciates the service provided by Cires21 Live Streaming Solutions as excellent, and encourages the company to continue working in the same line of excellence in order to improve its results in 2016 . The platform Cires21 live streaming allows us to manage and dynamically allocate resources not only to traditional TV channels and important events such as F1 , but also those of our TV channels that operate only on the Internet. Multiple profile access to the centralized management. The user management offered by C21 Live Control ensures flexibility both in managing distributed platforms as well as in delegating administrative tasks. The C21 Live Control users can have restricted or administrative access to the platform. Metadata insertion in the original content. Perfect for the integration with advertisement services, video players, etc. Virtualization support. The virtualization of the software allows for quick setting-up on client hardware or on private cloud. Transparent access to support services. The encrypted and virtual support network of Cires21 reduces dramatically the time and costs of any incident, it provides a secure and fast access method when confronted with any type of incident. Continuos operation with 24x7 support or Premium support service that adapts to the needs of any live event. Diagnostic tools. Ensuring an easy diagnosis of the problems which might arise by reducing the downtime in case of any system failure. High Availability. Ensures the redundancy of all components adapting to the availability needs of any customer. Decreases the effort in the management of streaming. The intuitive centralized web interface reduces dramatically the adapting time needed by the operational management. It allows for the automation of the administrative tasks, in order to maintain the highest quality and remove the service down-times to failures or maintenance operations. Reducing the complexity of configuration and integration processes. The unified interfaces of management (web, API,SNMP) offers the possibility of integration with third-party elements, adding intelligence to the system and enabling the reduction of costs in content management. Moreover, the centralized configuration management lowers the efforts needed when dealing with any kind of deployment, be it in the linear channels or live events. The ease of adapting to the customer's environment according to every moment's needs. The ability to manage and integrate any element ensures the streaming platform capacity to adapt any need, in addition to reducing the investment risk and optimizing the relationship between CAPEX and OPEX. Integration with C21 Live Cloud services. Opening a new range of possibilities with the components of C21 Live Cloud: C21 Live Encoder, C21 Live Mosaic, C21 Live Monitor y C21 Live Editor. Diversity in the operating models. Based on the C21 Live Cloud, SaaS, o appliance service, it ensures an easy adaptability to any business model. Components inventory: channels, encoding profiles and publishing points. Live management: start, stop, creation, recording, editing and deleting. Event scheduling: Automatically start and stop live events. Real-time live events interaction: logo insertion, blackout, metadata insertion, date and time overlay, starting and stop publishing. Cluster mode: active-passive with automatic failover. High Availability: 1+1, N+1 or N+N redundancy. Monitoring: SNMP, WEB Interface, API JSON Restful, performance charts, logs, C21 Live Control, content preview in the web interface. C21 Live Control enables the management of C21 Live Cloud, offing the full power of a physical platform matched with the advantages of the cloud. 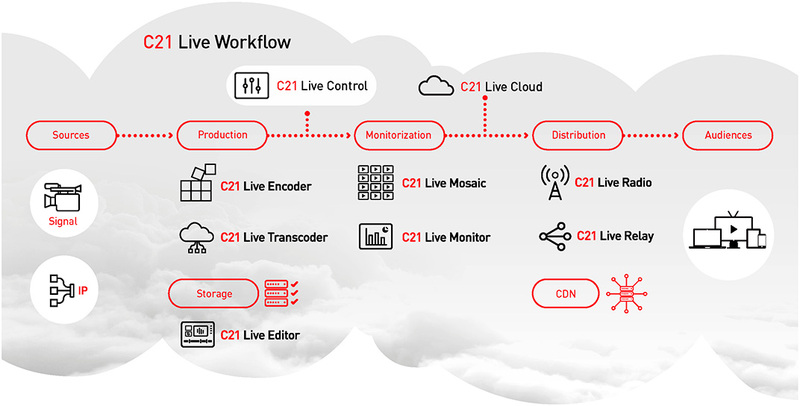 Moreover, C21 Live Control is also available in C21 Live Cloud, this option allows for the use of a fully virtualized platform, providing a whole new concept of encoding for events. Encoding resources optimization: the option of activating only what is needed and at the same time vary the amount of encoding resources in real-time, opens as a consequence a new opportunity to new encoding projects whose inversion in would otherwise be impossible. CAPEX/OPEX optimization: All the integration possibilities in a mixed encoding platform (appliance, SaaS and cloud). Cost reduction: logistics, remote management, monitoring by region. Universality: the possibility to enable the encoding resources available in different areas of the world.